4743 261aPa 5000 Mk. 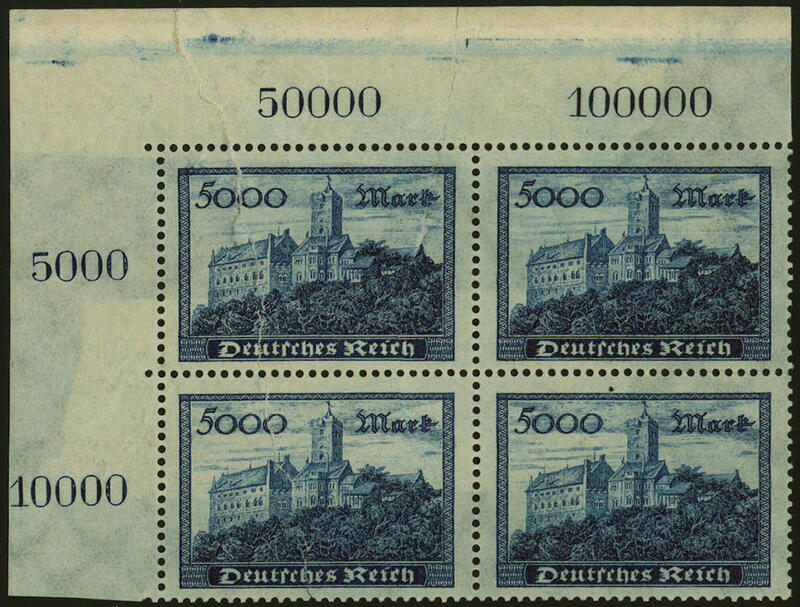 Wartburg Castle, corner margin block of four top left with glued paper web, in perfect condition mint never hinged the paper web was already before the printing, of the gum and the perforation fixed. Also in the Michel special catalogue unknown and in this kind probable unique! Photo expertize Dr. Oechsner BPP. 4744 ⊙ 278Y 8 thousand Mk. On 30 Pfg. 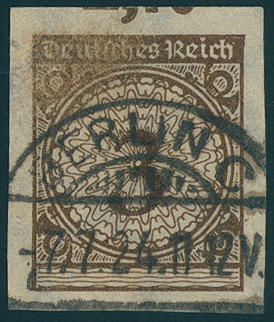 With scarce watermark \"waffle\", wonderful having bright colors and outstanding centered and perforated outstanding quality with centered stamp \"BERLIN 29.9.23. \". 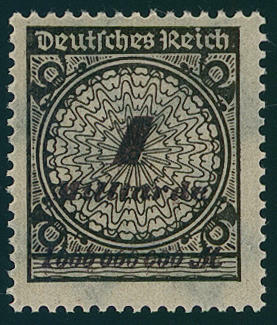 An exception copy this sought-after German Reich rarity for the highest standards! Photo expertize \"the condition is complete flawless\" Dr. Oechsner BPP. 4745 283I 25 Tsd. On 25 Mk. 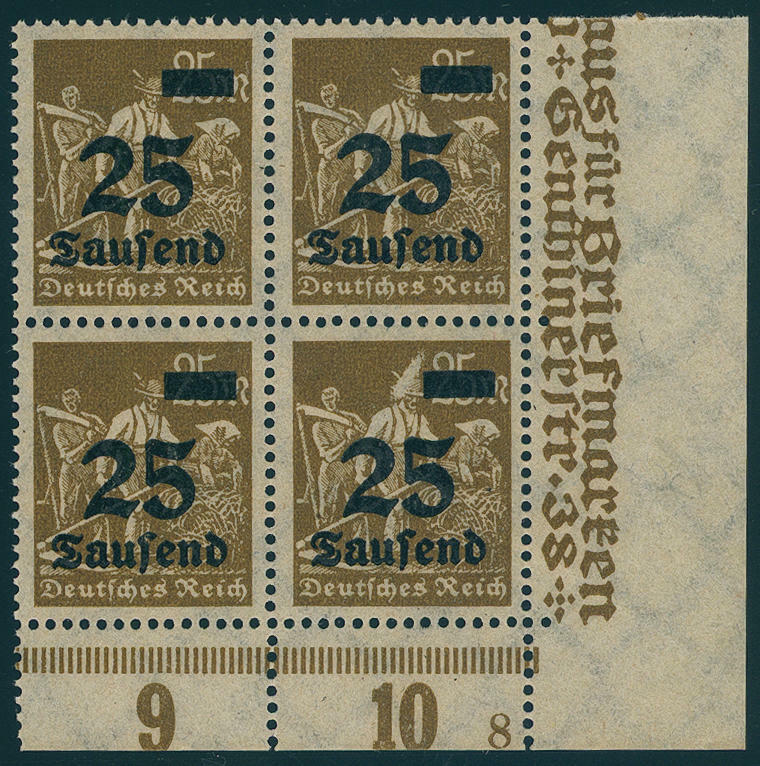 Block of four from of the right lower corner of the sheet with plate number 8. 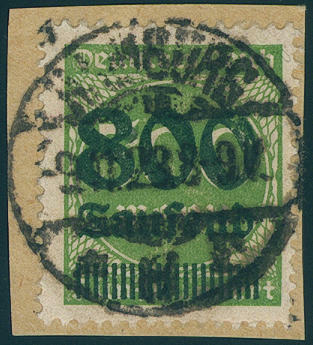 As well the right lower stamp with scarce plate flaw \"farmer with helmet\", which only in a small part of issue occurs, in perfect condition mint never hinged an attractive unit! 4746 296IIDD 250 Tsd. 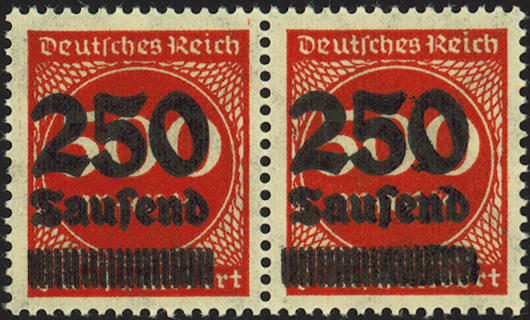 On 500 Mk., horizontal pair with double overprint, right stamp additional with 22 in lieu of 21 Strokes in the line bar, in perfect condition mint never hinged extremely scarce double variety, in this kind in the Michel special catalogue unlisted! Expertized Oechsner BPP. 4747 ⊙ 307 800 Tsd. 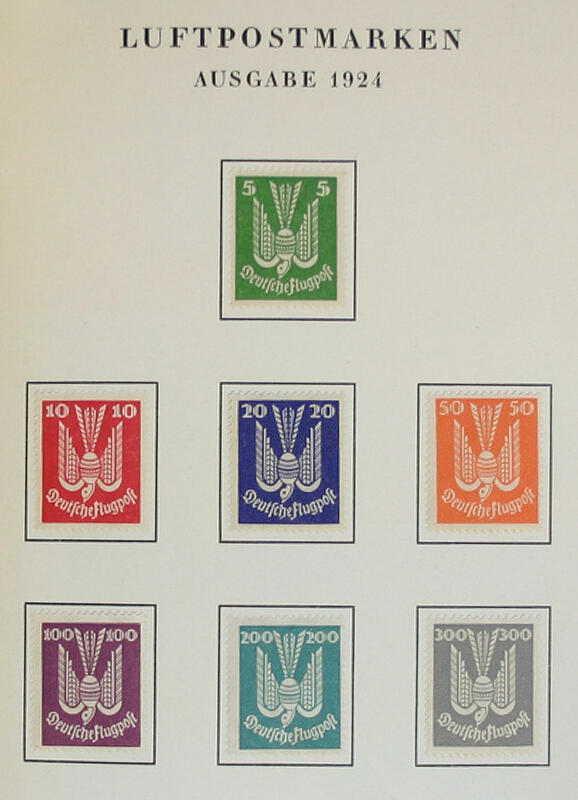 On 500 Mk., fresh colors and very well perforated, clean centric cancellation \"STELLINGEN 16.11.23. \". 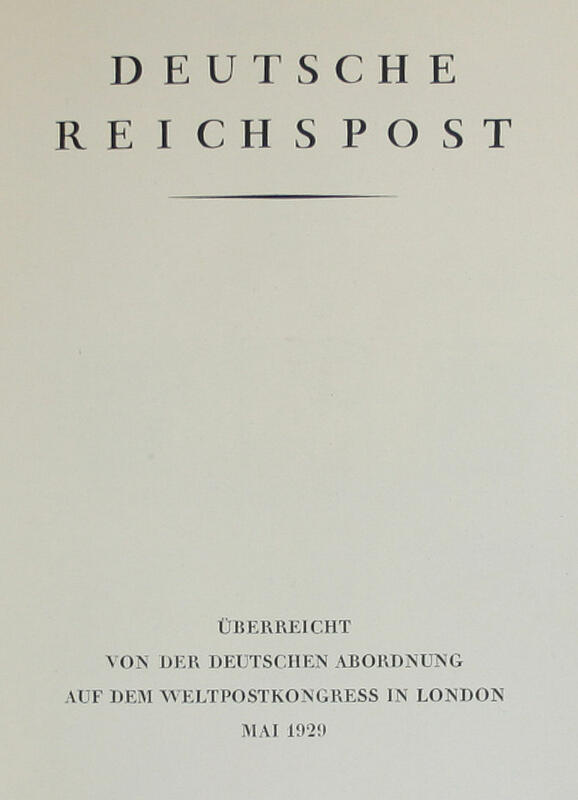 A very nice copy this sought-after German Reich rarity! Photo certificates Peschl BPP, Bechtold BPP. 4748 ∆ 307 800 Tsd. On 500 Mk. 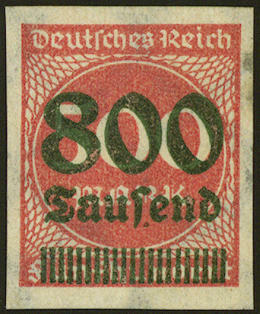 Fresh colors and well perforated on decorative small letter piece, centric and neat cancelled \"Hamburg 9.11.23. \". A very impressive copy this inflation rarity! Photo expertize \"perfect\" Winkler BPP. 4749 307PU 800 Tsd. 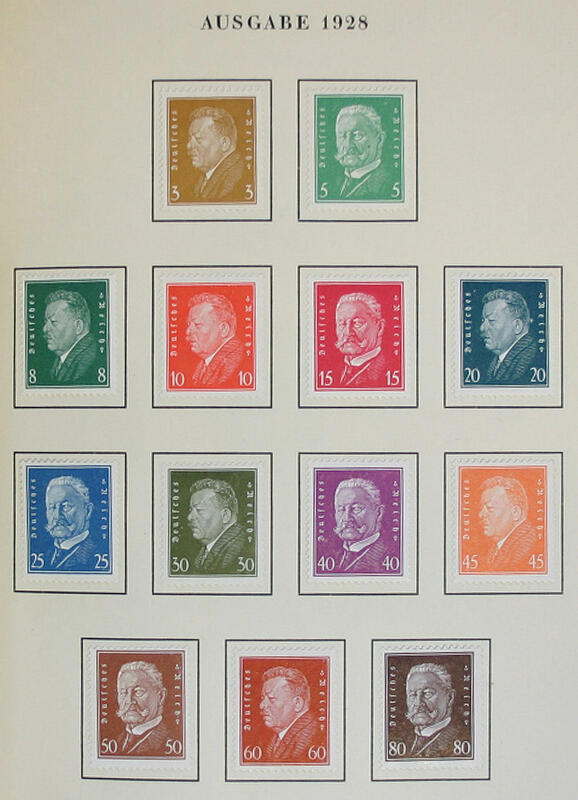 On 500 Mk., unperforated proof in red in lieu of green, unperforated, in perfect condition mint never hinged there are only few examples from this known. An inflation rarity! Expertized Peschl. 4750 ✉ 316AP 4 millions Mk. 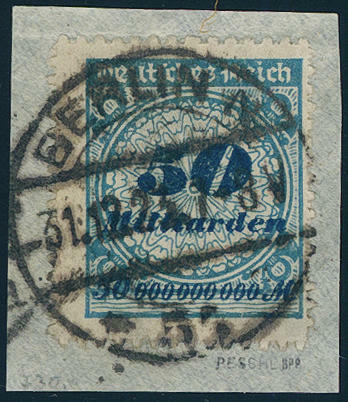 As correctly franked single franking on postal stationery (these only as form used and postage stamp impression annulled) from \"LÖRRACH 29.10.23. 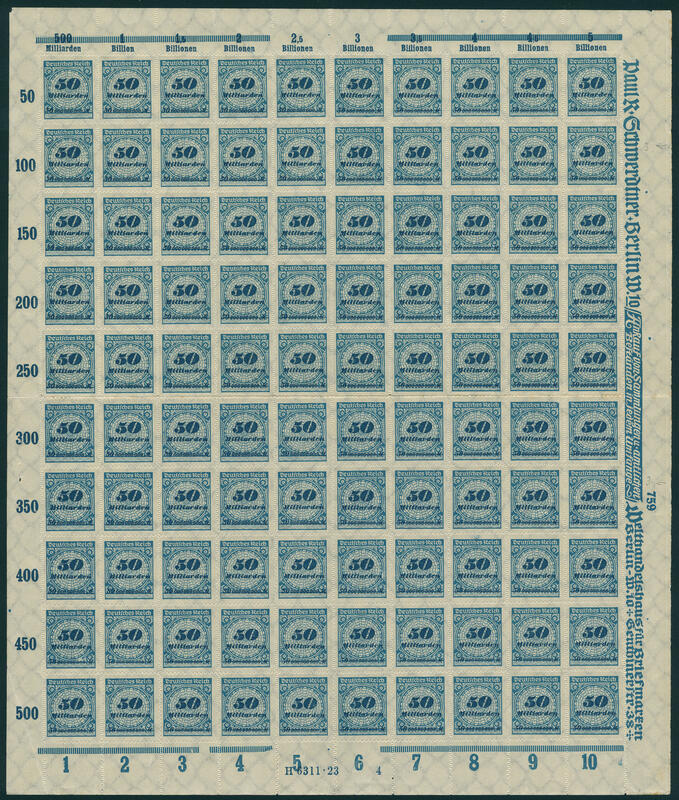 \", a little blotched, correctly franked as border rayon postage to Basle / Switzerland. Very rare! 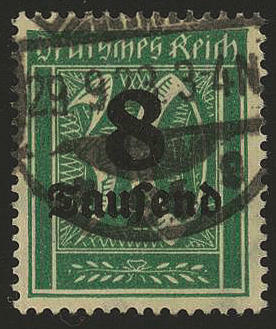 4751 ✉ 317A 5 millions Mk., vertical pair on border Rayon cover, a little rough opened, from \"WALDSHUT 20.10.23. 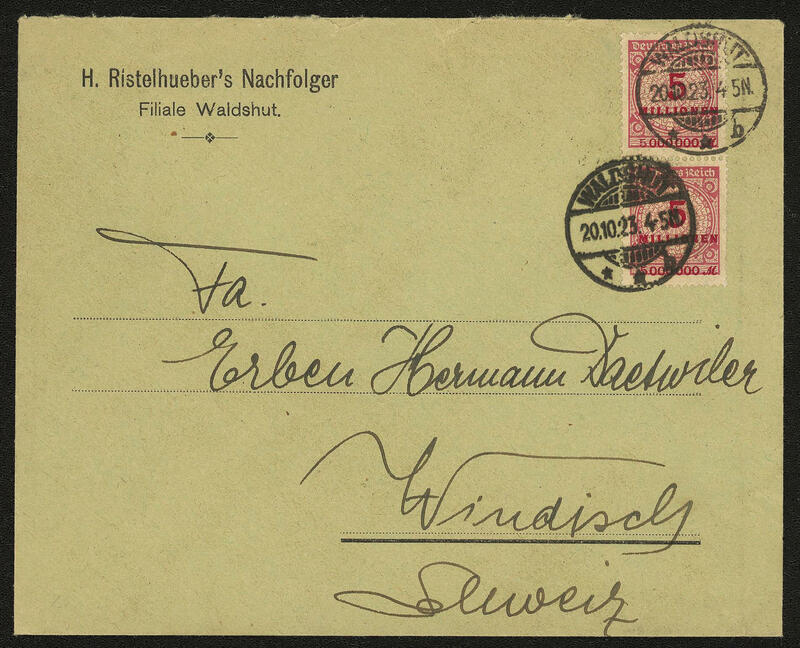 \" to Windisch / Switzerland. Rare! 4752 ⊙ 319AWb 20 million. Mk. 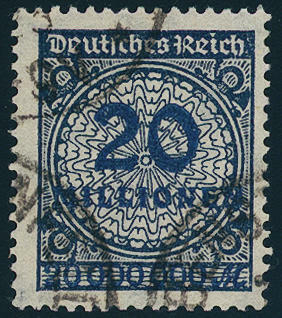 Black blue, rotary printing, the very scarce colour, fresh colors and neat cancelled a very nice copy this large inflation rarity! Photo expertize Dr. Oechsner BPP. Michel 2200,- €. 4754 325APb 1 Mrd (Billion). 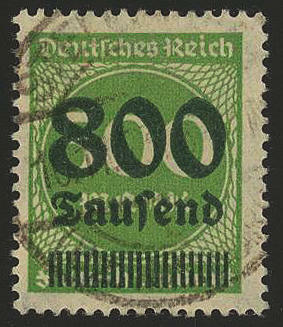 Black brown, plate printing, the scarce colour, fresh colors and very well perforated, in perfect condition mint never hinged, without any signs. An outstanding quality this inflation rarity! Photo expertize \"genuine and IN perfect quality\" Winkler BPP. 4755 325APbHT 1 Mrd (Billion). Mk. 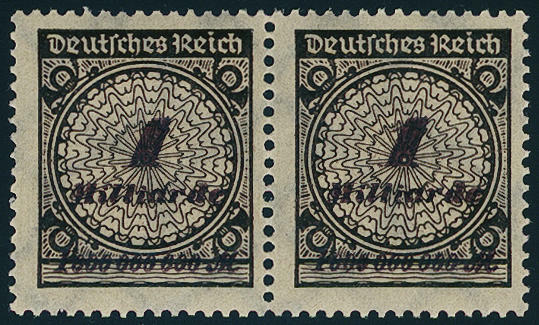 Rosette pattern, the scarce colour blackish brown in the plate printing, horizontal pair, fresh colors and very well perforated, in perfect condition mint never hinged as well the left stamp with plate flaw \"crack in the rosette\". 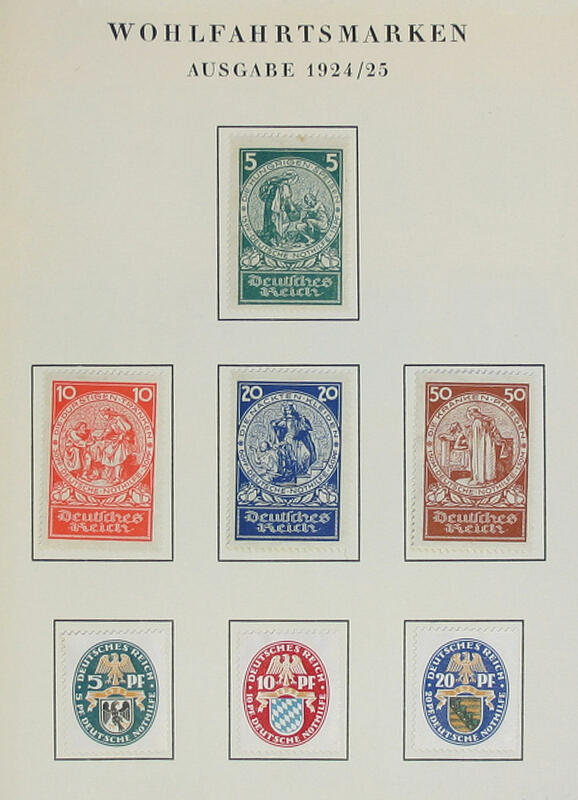 A wonderful and extremely scarce unit in utterly perfect condition. Photo expertize Fleiner BPP. 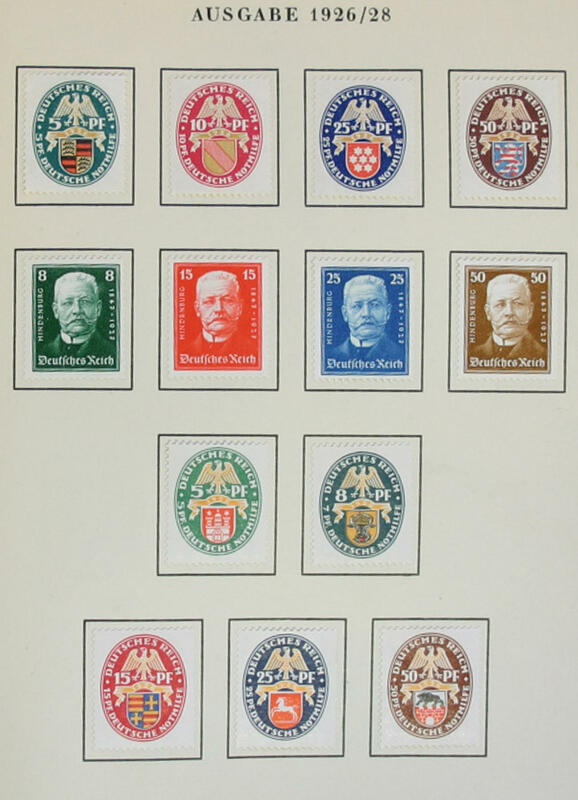 Michel for normal stamps already 2800,- €. 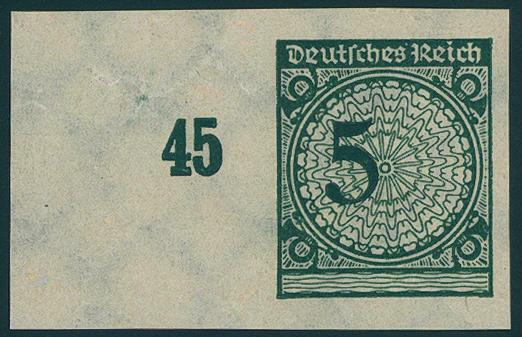 4756 330B 50 Mrd (Billion). Mk. 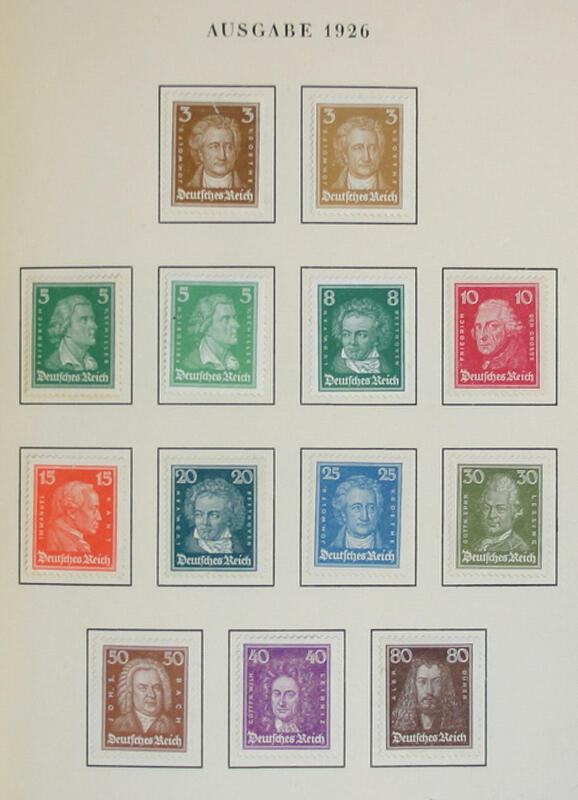 Rouletted, complete sheet to 100 values, centered prefolded, at the bottom here and there separated, in perfect condition mint never hinged Michel 700,- €. 4757 ∆ 330B 50 Mrd (Billion). Mk. 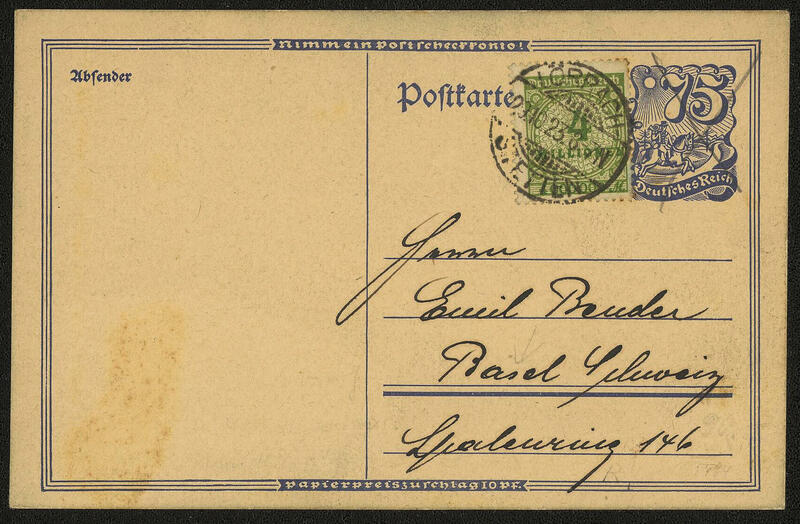 Rouletted, fresh colors and in perfect condition on very nice letter piece, perfect used \"BERLIN 31.12.23. \", an exception copy for high standards, expertized Infla / Berlin, Peschl BPP. 4758 ⊙ 331a 1 Mrd (Billion). On 100 Mk. 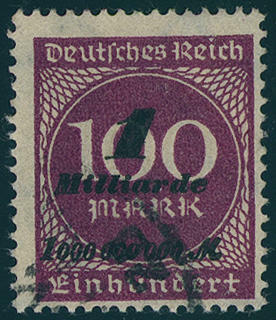 Violet purple, the so-called \"Hitler provisional arrangement\", wonderful deep colored and on self-formed pages \"WERNECK\". 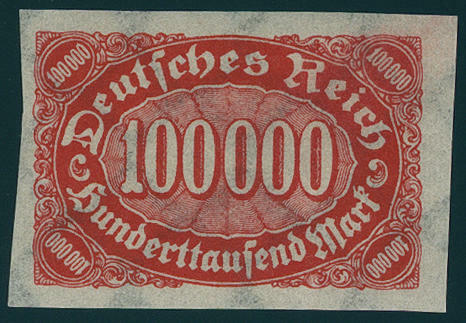 A beautiful copy this sought-after inflation rarity! Photo expertize \"perfect quality\" Oechsner BPP. Michel 4500,- €. 4759 ⊙ 338aU 3 Pfg. 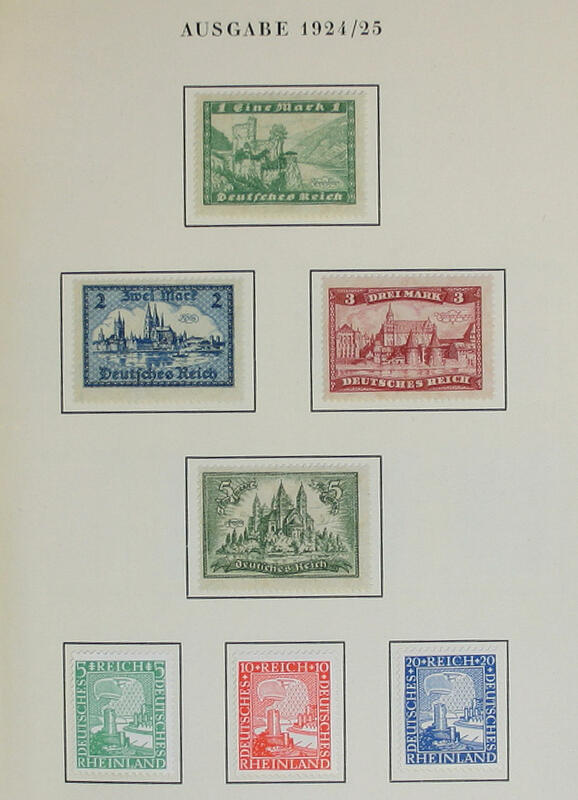 Postal stamps 1923 four sides unperforated, left above a little blurred, neat cancelled \"BERLIN 7.7.24. \", expertized Peschl, Schlegel BPP. Michel 350,- €. 4760 339aU 5 Pfg. 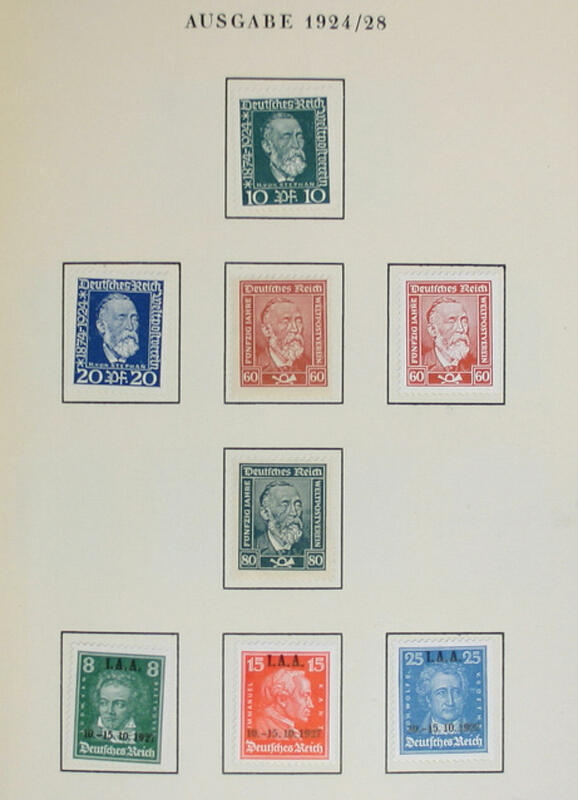 Postal stamps 1923, four sides with wide margins unperforated from left margin of sheet, in perfect condition mint never hinged, without any signs. 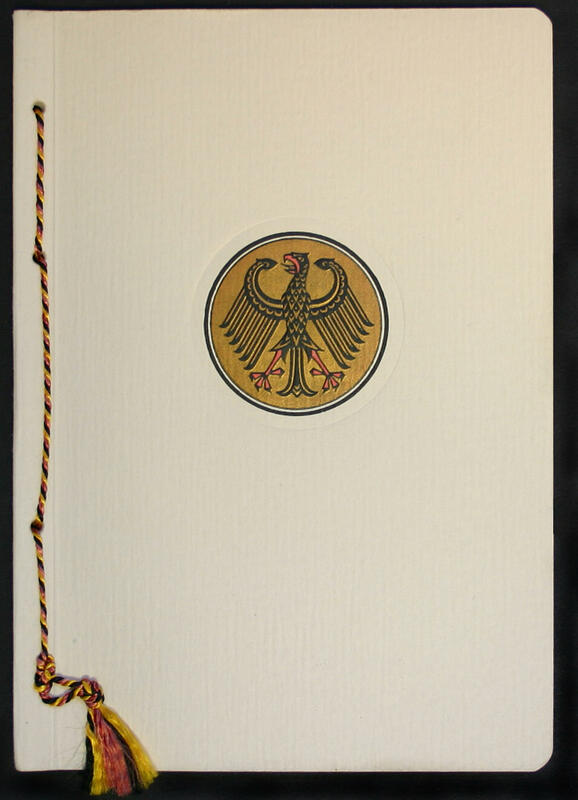 4761 GeF.Buch 344/422ex Minister gift book of the German Reichspost, presented from of the German delegation on the World postal service congress in London May 1929 with string. 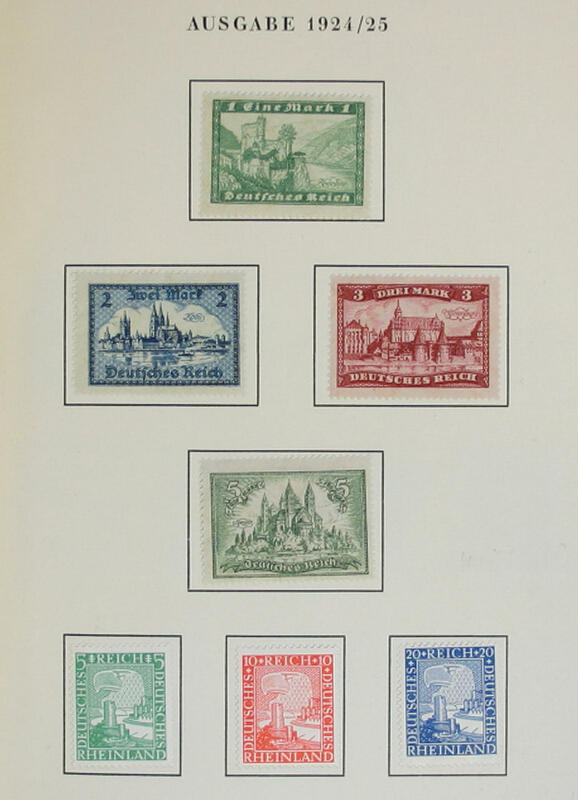 Included are numerous unused issues of the Weimar Republic including important German, I. A. A. 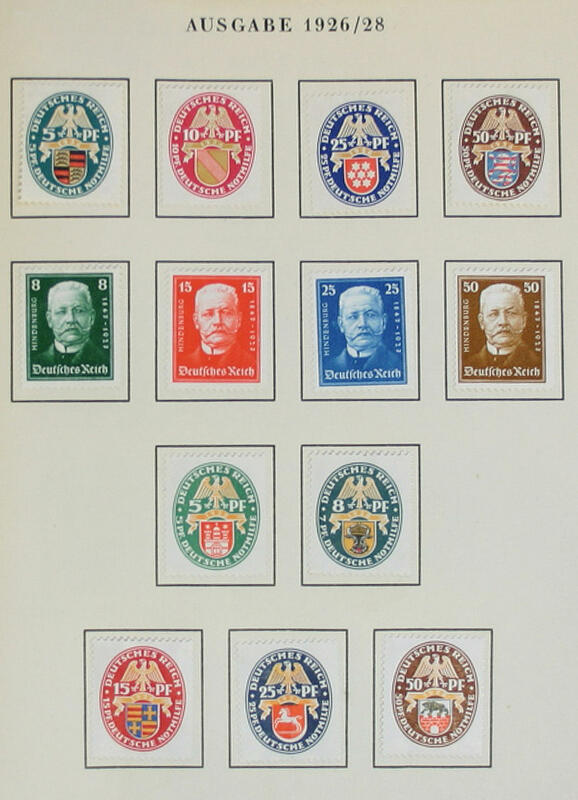 1927, Presidents of the Reich, help in need sets, official stamps and so on. It were only a few examples given to favored persons. In of this outstanding condition extraordinarily rare! 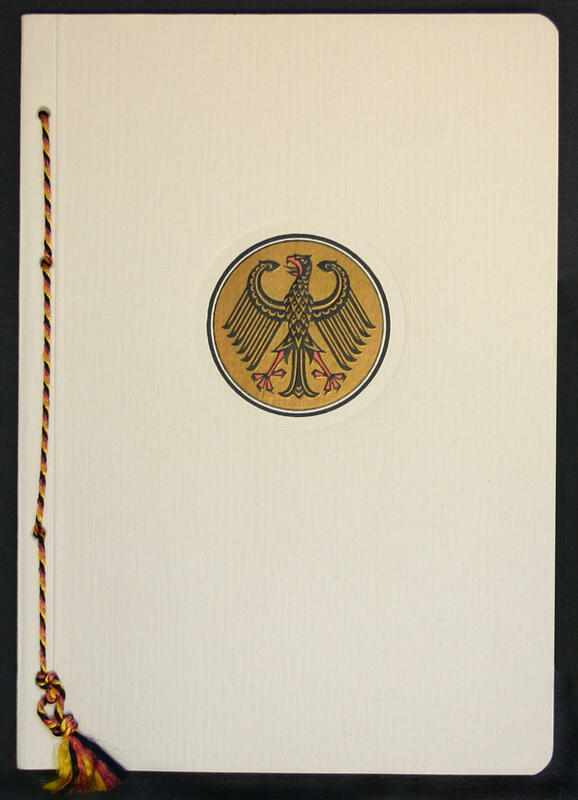 4762 GeF.Buch 344/424ex Minister gift book of the German Reichspost, presented from of the German delegation on the World postal service congress in London May 1929 with string. 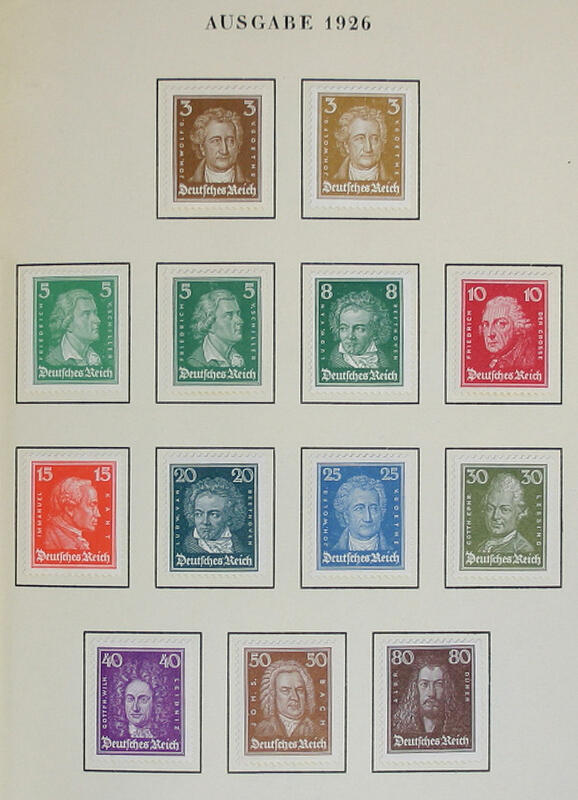 Included are numerous various stamps of the Weimar Republic unused including important German, Presidents of the Reich, I. A. A. 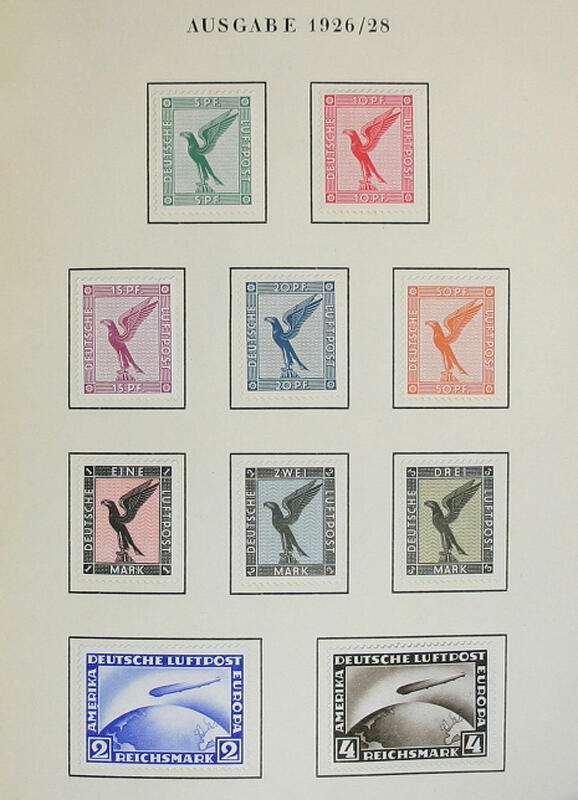 1927, wood-pigeon, airmail 1926, 2-4 RM. 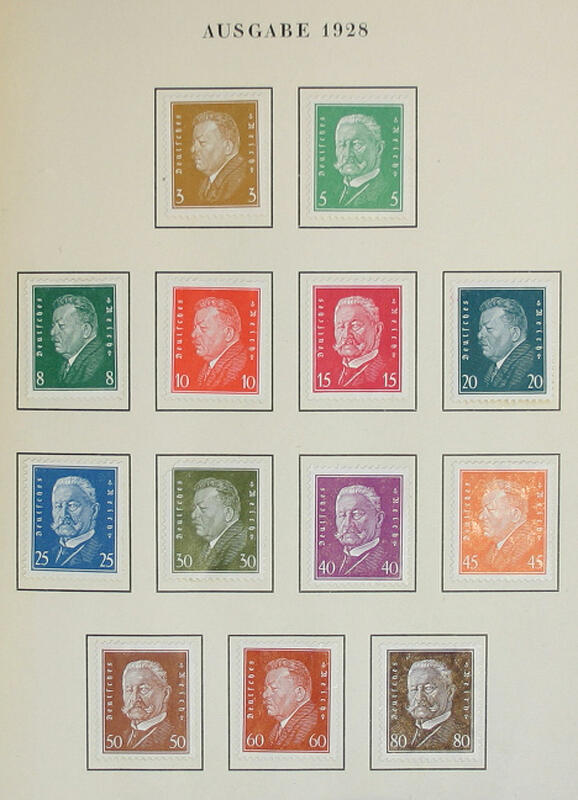 Zeppelin, help in need sets, official stamps and so on. 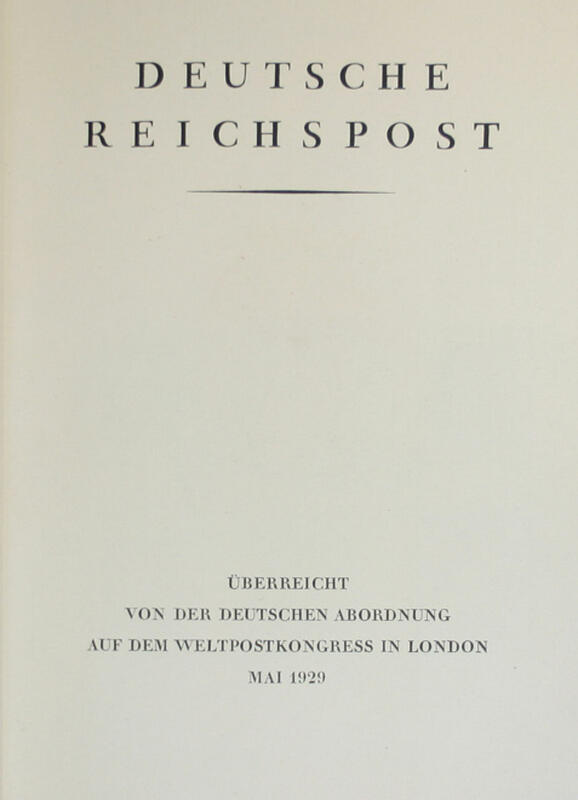 From this book were only a few examples at high place personalities handed over. In of this outstanding condition extremely rare!